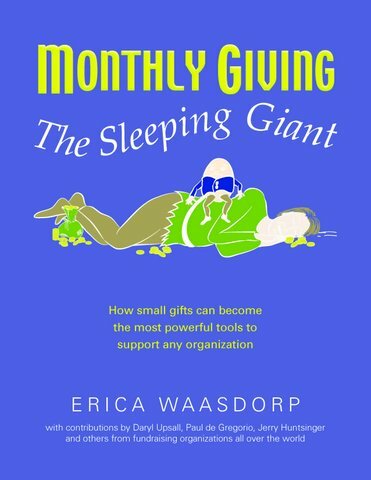 You’d be well served by ordering a copy of Monthly Giving: The Sleeping Giant, a very helpful handbook on monthly sustainer programs written by direct marketing expert Erica Waasdorp. But before I tell you more about this book, I wanted to share a few memories about sustainer giving. Like me, you may have childhood memories of depositing a weekly donation envelope in those baskets with the long handles passed down the pew at Sunday church services. I had a stack of those little envelopes, each one dated for a specific Sunday — just to remind me. Churches have certainly pioneered sustainer giving. Not only was I asked to contribute whenever I showed up for Mass, but the power of social proof (everyone else tossing in their envelopes) made it hard not to contribute. My 50 cents a week added up to $25 over the course of year – not a bad gift from a kid. And if I ever missed a week, that leftover envelope dated for the week I missed just screamed “guilty,” encouraging me to toss two envelopes into the basket the next week. Have you ever made weekly payroll deductions to a charity through a federated giving campaign like the Combined Federal Campaign or the United Way? Payroll deductions are another easy way to give small amounts of money that add up. Or maybe you’ve “sponsored a needy child overseas for just $22 a month”? Child sponsorship organizations have been the experts at securing larger donors through monthly giving. What other organizations do you know where virtually all donors make an initial commitment of over $200 a year? Turns one time annual givers into more regular and committed supporters. Makes it easy for your donors to give each month. Enables small donors to make bigger gifts than they would otherwise make. In her book, Erica offers a lot of convincing math, providing many examples of how monthly giving boosts fundraising results. With all this evidence, what’s stopping your organization from promoting monthly giving? Maybe it just feels too hard. That’s where this book can help. I think you’ll find the book to be very practical. It provides helpful examples shared by other nonprofits that you can use. Her examples show how to convert your current donors to monthly givers, how to acquire new monthly donors and even how to use social media to build your sustainer base. And there is a section on options for processing your monthly gifts, whether in house or through outsourcing. Be careful, though. Monthly giving doesn’t put retention activities on autopilot. As Erica points out, there aren’t a lot of publicly available studies analyzing monthly giving and donor retention. But the ones Erica presents show promising trends. Back then, our monthly donors (who were the majority of our givers) had a few options for sending in their monthly contributions. The vast majority were on an “invoice” system where we mailed a reminder each month. Those monthly invoice payers had an overall drop out rate of about 35% (new donors higher, longer term donors much lower). But for the donors on automated electronic fund transfers – their drop out rate was just 8%. Credit cards were similarly low. We believed that the reason for the difference was connected to the intentionality of the giving decision. What do I mean by that? Each time a donor had to write out and mail in a check, they got to decide all over again whether this charity was worth it. Lots of factors influenced that decision. But if the donor wasn’t completely satisfied with their relationship, they might not renew that next month. Automated deductions however are a “set it and forget it” mechanism (which indeed, some donors had done). There are fewer times that donor needs to make a decision about renewing. Usually the renewal decision for the sponsorship donors was triggered when their child was replaced or when their credit card expired. So if you are running a monthly giving program, you definitely want to get your donors on an automated payment plan. But even with an automated plan, you still need to treat your donors well. While donor payments might be set it and forget it, you certainly don’t want that to be your attitude toward your monthly givers. Erica walks you through some scenarios to consider in managing difficulties that might arise with the payment process itself. How do you measure success in a sustainer program? You’ll need to decide for your own organization what level of monthly giving is cost effective and produces a worthwhile return on your investment. For example, Erica cites percentages of donors on monthly payments in the range of 6-31%. If I remember correctly, maybe 75% of our child sponsorship donors gave monthly. Monthly giving was the giving model in child sponsorship, unlike most other organizations. So our measure of success at the child sponsorship program was how many monthly givers moved to automated payments, rather than a invoice system. With an aggressive, and I mean aggressive promotional program, the child sponsorship organization I mentioned had managed to convert 23% of our donors to autopayments. Compared to our US colleagues at the time, our 23% on automated payments was pretty impressive. But pretty lousy compared to our European colleagues where 90% of their donors were on automatic debit plans. You’ll find an interesting thread on this cultural difference at The Agitator. I found the comments really helpful in thinking about some of the challenges of monthly giving. Determine what return on investment is needed to call your program a success. Use monthly giving to help turn smaller donors into bigger ones. Automating payments improves retention rates. Like all giving, to get donors to convert to monthly programs you have to ask. A lot. Make it easy for your donors to give this way. And by all means, don’t forget to thank your donors appropriately and keep sending them information about how their gifts have made a difference. To help you get started, buy Erica’s book. As paperback or ebook. You’ll find it very helpful. P.S. Today’s donor doesn’t even need you to set up a monthly giving program. If they already pay their bills online, they can set up their own recurring monthly gift to your organization. This puts all the control in your donor’s hands, which may be just want they need to overcome any reluctance about automated giving. P.P.S. I’d love to hear about your experiences with monthly giving programs. When did you set up your program? What tips for success can you share? What was your greatest challenge?